Bottle cages have been widely in use in the bikes for the convenience of the rider to carry the water, juices or other drinks. These cages are placed on the rear or on the frame of bike. The growing number of bicycle in various sports such as racing, mountaineering, and others has increased the scope for bottle cages. Taiwan has huge market of bicycles, largely produced and exported from Taiwan. Europe is largest importer of bicycles from Taiwan. The various cycling sports such as Taiwan Cycling Festival that includes multiple cycling events, attracts increased supply of bicycles, equipped with bottle cages. New routes are being constructed in Taiwan that is highly suitable for cyclists. In 2017, 300 km route has been build, and Taiwan is considered as Asia’s leading bicycle city. 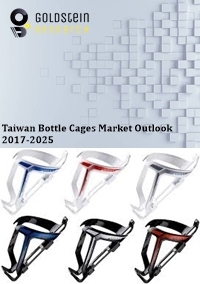 Goldstein Research analyst forecast that the Taiwan bottle cages market is expected to grow at a CAGR of 3.1% over the forecast years. The easy availability of raw materials, consumer preferences, number of bicycles, number of advanced bottles useful while biking and more are some of the factors that will grow the bottle cages market as per the forecast. The report covers the present ground scenario and the future growth prospects of the bottle cages market for 2016-2024 along with the sales and revenue of the bottle cages. We calculated the market size and revenue share on the basis of revenue generated from major players across the globe. We have forecast the market on the basis of shipment of the bottle cages, manufacturers and distributors of the bottle cages, market trends, raw material supply, cyclist population, demand and supply of bottle cages. On the basis of material, fiber reinforced material (FRM) accounted for the largest market share of 39.2% in 2016 of the total Taiwan bottle cages market. Taiwan has sufficient supply of FRM and its lightweight property keeps the total weight of the bike low, hence bottle cages of FRM have been majorly purchased as compared to other material bottle cages. Aerobar cages market is growing at a fast rate of 4.3% annually, being convenient for the riders use as per the position and carrying space of the bottle cages. Bottle cages market outlook 2016-2024, has been prepared based on an in-depth market analysis from industry experts. The report covers the competitive landscape and current position of major players in the bottle cages market. The report also includes porter’s five force model, SWOT analysis, company profiling, business strategies of market players and their business models. Taiwan bottle cages market report also recognizes value chain analysis to understand the cost differentiation to provide competitive advantage to the existing and new entry players. There is a rising trend of new manufacturers of bottle cages are coming up from within the country and even the foreign companies, as Taiwan has become the preferred destination economy benefits from regional economic dynamics, high purchasing power population and the presence of high-technology penetration. According to the report, major driving factor for the growth of bottle cages market is the lack of space on the bikes, and the requirement of space to carry bottles along. Using any other methods such as basket on rear makes the bicycle heavy and unbalanced. The mountain bicycles, cross-country bicycles and others regularly need the use of bottle, thus driving the growth of bottle cages. Further, the application of FRM bottle cages is also associated with high prices, making the product costlier than other types of cycle accessories and thus it becomes difficult for the manufacturers to readily opt for such options. Based on geography, Central Taiwan had the largest share of 63.2% of the total Taiwan bottle cages market in 2016, with the presence of maximum number of the bottle cage manufacturers such as BEV International Corp., Karbona Parts Inc. and others. Central Taiwan is opportunistic market and it is expected that it will continue to grow at a rate of 3.1% annually. Taiwan bottle cages market report comprises of the following companies as the key players in the bottle cages market: International Corp., Karbona Parts Inc., Shuz Tung Machinery Industrial Co., Ltd., Chern Shianq Enterprise Co., Ltd., Asia Bicycle Trading Company. What is the revenue of Taiwan bottle cages market in 2015-16 and what would be the expected demand over the forecasted period?